Muscular tension dysphonia, in which posterior commissure inexplicably does not fully adduct. Prephonatory instant, standard light. Postphonatory instant with blurring, standard light. Maximum open phase of vibration, strobe light. Maximum closed phase of vibration, strobe light. Incidentally, the projection from the edge of the cord is mucus, not swelling. This extensive voice user experiences upper voice limitations, extreme breathiness (air-wasting during phonation), and neck discomfort. When making voice, the cords are significantly separated posteriorly such that the major part of air is wasted. The white dotted lines should be fully together, with only a thin dark line between the cords. Strobe light, closed phase of vibration at B-flat 3 (approximately 233 Hz). 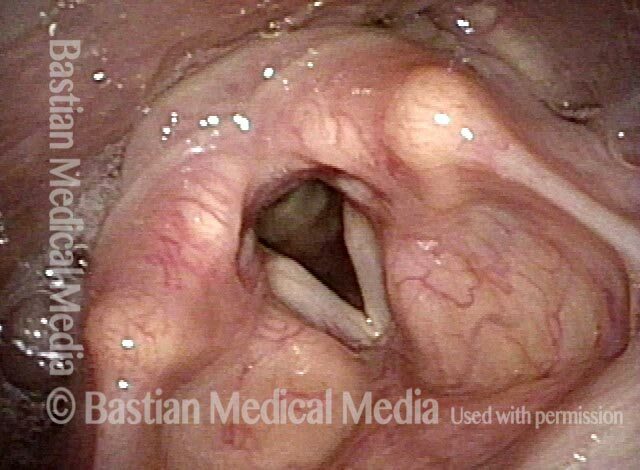 The translucent, polypoid nodules come into early contact, but equally if not more importantly, the posterior vocal cords remain significantly separated as a vocal cord positioning inefficiency. Open phase of vibration at the same pitch. Singer in late teens, already with 11 years of vocal training but breathy quality. In this quiet breathing view, the dotted oval outlines interarytenoid pachyderma (suggesting reflux). This, and a barely-visible lesion of the right cord (left of photo, indicated by black arrow) draw attention, but are red herrings. Dotted lines are for comparison with following photo. Closer view under strobe light at D4 (approx. 294 Hz). This is the maximum closed phase, yet there is still a large gap posteriorly. Notice that the vocal processes (embedded beneath the grey area indicated by dotted lines) are inappropriately separated—the hallmark of MTD. Also under strobe light but at F#5 (approx. 740 Hz). This dramatic and undesirable, dysfunctional gap is seen at the maximum closed phase and is one visual correlate of this singer’s remarkably breathy voice. Again at F#5 under strobe light, but at the maximum open phase of vibration. 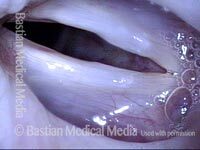 Now seen is a small mucus retention cyst of the right vocal cord (left of photo) at arrow, entirely a red herring finding. The important finding is the remarkable separation of the vocal processes, as in photos 2 and 3, indicated by dotted lines. Nineteen year-old singer with “small, quiet, breathy voice,” whose throat feels strained, tight, and choked when she tries to sing. This view shows the position of the cords one frame (1/30th of a second) before vibration begins. Note the remarkably wide “stance” of the cords. Eleven video frames (1/3 of a second) later, during phonation, the vibratory blur makes the cords appear slightly closer, but the “stance” of the cords is actually the same as in photo 1 above. See short vertical lines for reference between photos. A middle aged woman describes a weak, effortful voice. Many months earlier, she recovered fully from a grave illness that put her in a coma for several days. She dates the voice change from that event. At the prephonatory instant, a split-second before vibration begins, showing that the cords do not adduct fully. Phonatory blur under standard light. 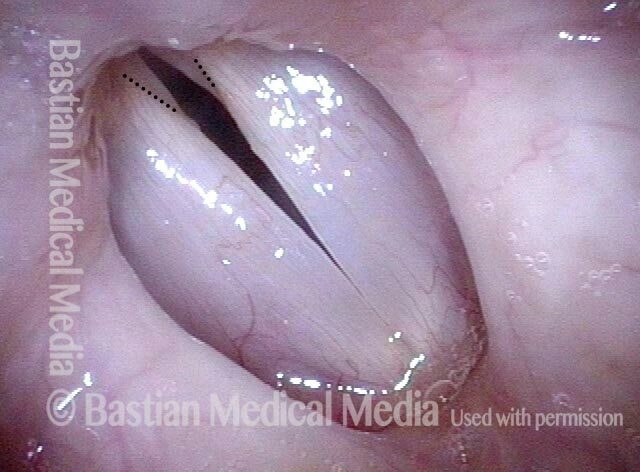 Notice that the vocal cords are separated posteriorly to the same degree as in the prior photo. This can be mistaken for MTD, but is not. At closer breathing view, one can see an endotracheal tube injury. 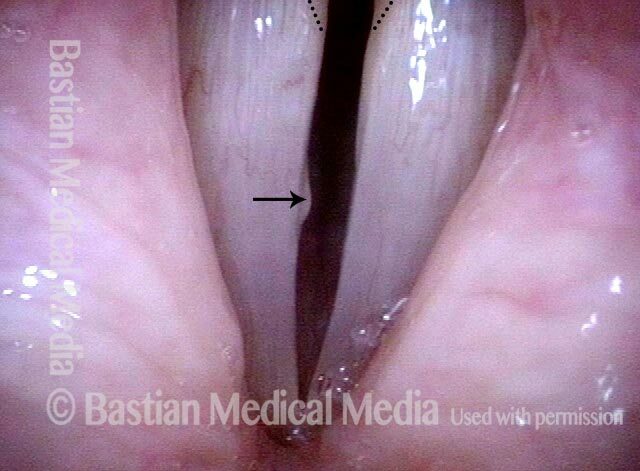 There is an erosion of the posterior left vocal cord (right of photo), with loss of the expected straight line (dotted lines). 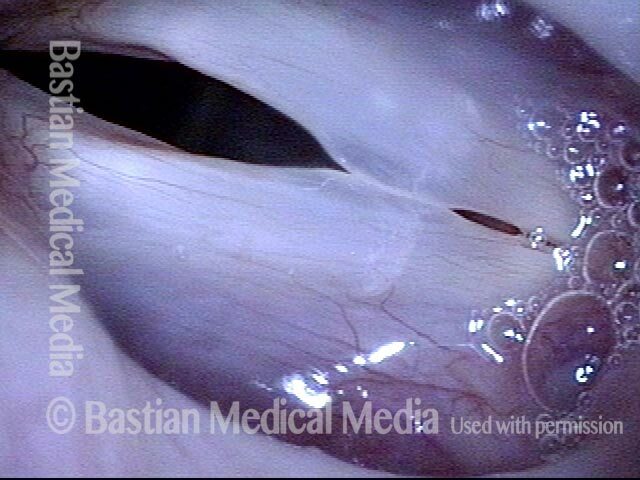 The 'X' shows additional area of scarring from the endotracheal tube. The issue here is that the cricoarytenoid joints are damaged; they allow full abduction (separation) of the cords for breathing, as in this photo and photo 1, but do not allow full adduction (approximation) for voicing (seen in photos 2 and 3). Hence, her normal breathing, but weak and air-wasting voice. The therapy approach here would be similar to for MTD, however, and there are some modestly-helpful surgical interventions that can also be considered. Closed phase at A5 (880 Hz) under strobe light. Arrow points to line of sulcus. The entire white area (within dotted line) is buried squamous mucosa lining the sulcus. Also at A5, but open phase of vibration. Sulcus opening (arrow) is a little more evident. Note most of all that the distance between the cords at their posterior ends is similar (a little greater in this view due to mucosal displacement of the upper surface of the cords). In a more distant view under standard light at A5 (880 Hz) that shows the posterior vocal cord separation more clearly during phonation (note blurring caused by vibration). Two weeks after successful surgery to remove the right sulcus (left cord margin elevation undisturbed pending verification of restored right cord oscillatory ability). The prephonatory instant at A5 (880 Hz), shows that the posterior commissure separation is virtually identical to preoperatively, proving that the MTD posturing abnormality, and not only the sulcus, is a primary issue for this voice. Still under standard light as in photo 4, phonation (and blurring of the margins) has begun and both cords vibrate well. Upper range has been extended by this surgery, but breathiness throughout the range is still evident. The remaining challenges are to re-posture the vocal mechanism, and then consider smoothing the left cord margin (right of photo), depending upon residual limitations caused by it, and patient needs. Nodules and severe MTD. This is prephonatory instant, standard light at low pitch (C4, or approximately 262 Hz). A moment later, with phonatory blur, also under standard light. Eight days after removal of the nodules. Prephonatory instant at a much higher pitch (E5, or approximately 659 Hz). Notice the persistent gap. Slight irregularities will model away with time. A moment later, with phonatory blur. The large gap remains evident. E5 but now under strobe light at “closed” phase which is of course not at all closed due to the MTD. Open phase. This person has an excellent surgical result but will need considerable work to bring the cords into full approximation. Young mezzo-soprano with “fuzziness” in her sound. In this abducted, breathing position, one can see bilateral vocal cord swellings, at the arrows. Pre-phonatory position for E5 (659 Hz) under standard light. The swellings are more clearly seen, but the MTD gap is enormous and greater than would be needed to accommodate the swellings. Phonatory blur as she sings E5. Large gap remains. Under strobe light, closed phase of vibration at A-flat 5 (831 Hz). The arrows indicate vocal processes widely separated. The points of these two arrows should instead touch. Still at A-flat 5, open phase, with wide separation of the posterior cords. Surgery would improve this voice a lot, but other than the occasional ‘self-correcting’ individual, would not fix this large MTD gap. Distant view at the prephonatory instant in young female singer. There is a wide gap between the cords. The explanation for this gap is not immediately evident, but the voice is breathy. Phonation has started with margin blurring, and the sense of extra space between the cords remains. Closed phase of vibration, still at B4. Note the incomplete closure posteriorly caused by MTD. Arrows indicate the vocal processes. Open phase of vibration, strobe light, at F#5 (740 Hz). 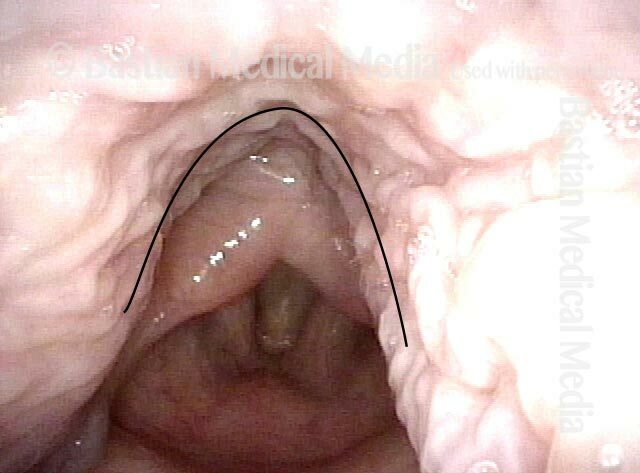 Here, the subtle indicator lesions are seen more clearly; vocal cord margins are not perfectly straight. “Closed” phase of vibration is not really closed and the vocal processes do not come into full closure, again consistent with MTD. Normal-appearing vocal cords in young singer plagued by inconsistency of capability, effortfulness, breathy voice quality in middle and lower range. At the high pitch of G5 (784 Hz), vocal cords come into fairly good approximation, including posteriorly, at the arrows. In low voice C4, during phonation (blur, under standard light), the posterior cords separate (arrows) into the posture of muscular tension dysphonia, with breathy quality. None of the photos so far are adequate, however, to evaluate posterior commissure. Under strobe light, at C#4 (277 Hz), closed phase. Note the large separation between the vocal processes, responsible for breathiness. Still at C#4, but open phase of vibration. At the high pitch of F5 (698 Hz), closed phase, note that the vocal processes come into approximation, and there is no breathiness. Again at F5, closed phase isn’t quite closed, but note again that vocal processes remain approximated. Middle-aged soprano with loss of upper voice, and tremendous strain attempting to make it. Here producing A3 (below middle C), the pharynx is relatively uncontracted and makes a long broad arch (see line). At only middle C (~262 Hz), the pharynx is already surprisingly contracted and is beginning to close the pyriform sinuses and "hug" the larynx. Truly remarkably, at just A4 (~440 Hz) the pharynx is practically maximally contracted, and the patient experiences paralaryngeal aching trying to make a pitch a full octave below what should be possible for her. "Closed" phase of vibration at G4 is not closed, in classic "MTD" fashion, and the vocal processes indicated by dotted lines should be completely together but are not. In a somewhat distant view under standard light, the findings of MTD are seen but not clearly. Note that at the prephonatory instant, the gap between the vocal cords becomes gradually wider as it travels posteriorly (to the upper part of the photo). Now during phonation (note blurring), the vocal cords are still separated posteriorly. At a more appropriate distance and under strobe light at G4 (~392 Hz), closed phase of vibration. The vocal processes remain separated. Open phase of vibration, at the same pitch, same vocal process separation. Closed phase of vibration at D5 (~587 Hz). 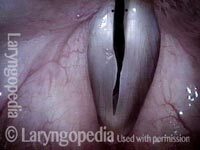 Note that the vocal cords are longer, and look again at the vocal processes. At open phase of vibration, also at D5, the MTD remains obvious. This is a young soprano opera singer with significant margin swellings bilaterally. The dotted lines indicate what would be the normal margins. The upper voice is very impaired and swelling checks were strongly positive. Closed phase of vibration under strobe light at E5 (659 Hz). Early contact of the swellings, and significant gap of MTD posteriorly at the vocal processes (indicated by dots). Open phase of vibration at the same pitch also shows gap, if anything a little exaggerated. Six weeks after microsurgical removal of the nodules. Strobe light at G5 (784 Hz). Voice now has "original equipment" capabilities, and swelling checks are normal even to C6 (1047 Hz). Open phase of vibration still at G5, showing accurate match and bilaterally equal mucosal vibratory excursions. The MTD gap at dots remains, but has partially self-corrected. In some other patients, the gap remains precisely the same after surgery as before, and in that case, necessitates further work with a MTD-qualified voice teacher or speech pathologist. Open phase of vibration at A4 (440 Hz). Moderate-sized vocal nodules, but the gap between the vocal processes (at dots) seems wider than the combined projection of the nodules. Closed phase of vibration shows that the nodules barely touch. It appears that the MTD gap is greater than would be necessary to accommodate the nodules. After surgical removal, this gap sometimes self-corrects; sometimes it does not, as if the "ghosts" of the nodules remain.